In which I take pictures on the river on a day off. I am writing this blog at 3:37 PM. By 3:37 PM today I have already seen actors auditioning for my December play, queued up social media for my tarot and theatre business, and pitched three articles. I've e-mailed clients, and now I'm writing this. I'm also seeing a show tonight that I'll wake up in the morning and review. On paper, I pass as fairly productive and successful. Yet I stay relatively chill, which causes a lot of people to ask me how I manage three careers so easily. To which I respond: I don't manage them easily. Ha! I'm stressed out all the time! I have like four different anxiety disorders! Only two are work related but still! I digress. Easily or not, I do manage those careers and have fun in between. So I do understand why people ask me how I do it or what my secret is. Unfortunately though, when most people ask me that they seem to be looking for magick and wisdom, some miracle or pearl they can hold to. My answers are...um...not the most satisfactory. I sleep as close to eight hours a night as my body will let me. 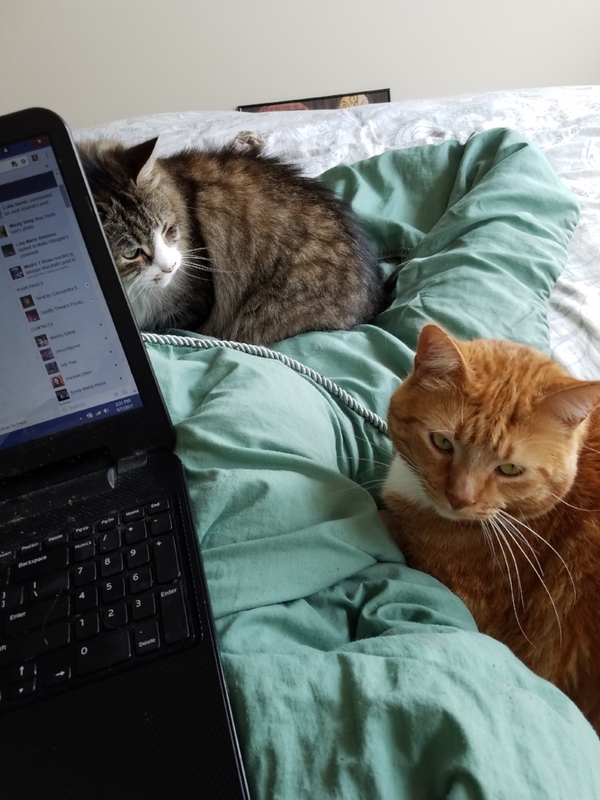 I don't let myself get distracted during a work session by fun social media or my cats wanting attention, but I do take breaks to nurture those things. I cut my work day down by over 90 minutes a day when I stopped checking Facebook every ten minutes. That's 90 minutes of good cat cuddling time I was wasting every day, y'all. I take my meds and drink lots of water. I do something for every career every day. I also do something fun and something for self-care that isn't just “food and meds” every single day. Every. Single. Day. I eat when I'm hungry. I keep my apartment fairly orderly for focus reasons. I keep a paper planner with to-do lists at my side when working. It's old-fashioned and boring. It also works. I take days off. Wild and innovative, I know. But this stack of comic books isn't going to read itself, and what am I supposed to do—NOT go to the beach when it's super nice out?! Psssh. I can't believe I was losing 90 mins a day with these guys to Facebook. Which, hilariously, is also featured in this photo. Look, the reality is I don't have kids. I do lose entire days to sickness, but still manage to get a bare minimum done on those days. Not everyone can do that. I also have an incredibly supportive group of friends and family. They are all also part dreamer, part doer who own restaurants, run Reiki businesses, and make lots of of art--so they get it. All of that means that in the grand scheme of things, I'm incredibly blessed in flexible time and having support. My life is probably not manageable with kids, and it certainly was not manageable before I was on proper meds for my 9,000 chronic illnesses. Certainly I have had bad family relationships and incredibly toxic social groups, and you know what? I didn't realize it then but my careers suffered greatly in those times. By sheer stroke of luck, my circumstances allow my careers to flourish and that's the harsh reality of success sometimes. Don't beat yourself up if things take you longer because of other dreams you had, mistakes you made, lack of support in your life, or really anything else. To summarize: If you're juggling multiple careers and a whole life outside of that, how do you ensure success? Allow for it to happen over time. Don't rush. Oh, and take care of yourself first, your loved ones second, and your careers third. You'll get where you need to go. I'm still working and hammering out what I want this column to be, but I think for now it's both a good place to find out about other solo entrepreneurs and the balls they're juggling while exploring some personal blogging too. Today felt like a more personal day for one big reason: I just closed an art gallery. Now, for those just tuning into my blog perhaps for the first time, in addition to doing tarot and writing I run a theatre company called Gadfly Theatre Productions that does queer and feminist work. Sometime last year we started aching for our own space, and it turns out, a good friend of mine decided to buy a restaurant, which means she needed someone to take over her lease at a popular small art gallery. The space was ideal for rehearsals, staged readings, and open mics. It was a wonderful creative found space for our mainstage shows. We got to rent out the space for low cost to other marginalized artist and I always felt so good and aligned handing out the door code to renters. Gadfly made four really stellar events of our own in the space, and we partnered with other creators to make their dreams come true too. Longtime Gadfly fans had an amazing time knowing where to find our provocative work. Gadfly is meant to be a theatre company that has four walls. (I tried to make a pun here about the fourth wall. It didn't work.) My business partner and I are meant to run a space. My cutie pie business partner and favorite human goofing off as we cleaned up the space one day. So no one was more surprised than us when we decided to shutter it suddenly in late June, with a move out date only two weeks later. The "what happened" isn't important for the purposes of this blog, but the whole sudden move out process moved around a bunch of stuff in my soul, and these are the reminders and lessons I felt fit to share. Holy wow, stop and take stock of your growth once in awhile. Manny (my business partner) and I just kind of decided to get a space, and then one fell into our laps. There's a whole bunch of spiritual sentiment wrapped up in that too (manifesting works y'all), but the main takeaway was this: For eight years Manny and I have worked almost every day creating work for this company. We have worked hard, and we have rarely complained about how hard we work at this for as little money as we do. We don't even really get that exhausted doing it. We love this company. We love theatre itself. We love the love and community our work creates, and we loved moving that into a space. So it never occurred to us that paying bills in the space might be hard (we had one hiccup but it was otherwise totally fine.) It never occurred to us that scheduling snafus, managing events we didn't produce, and a whole list of other things might drag us down (it didn't). We worked hard and steadily, and when it felt right we moved into a space. As I was moving physical objects out of the gallery I realized how silly it was that we never took a moment to be proud of ourselves for such a huge step forward. It's a big deal to successfully run a space and create the relationships we did. I don't think I ever would have realized that without such a sudden move out, and it's an incredible reminder to look at how I've grown in the other areas of my life. I have two steady writing gigs, a steady tarot gig, and my writing and readings get better every day. I'm teaching tarot now. I mostly buy food I have to cook at the grocery store. I listen when my chronically ill body is screaming for a break. I have open, painful but real conversations with friends and family when they hurt me or I hurt them. There are so, so many ways I have grown exponentially in the past couple of years. Yet I have never fully stopped, looked around, and said "Wow, good job me" until after the gallery move out. Everyone reading--once you're done, think through where you were a year ago and where you are now. I promise you've moved forward. Congratulate yourself on growing. Know when an experiment is over. A year ago I was SURE I wanted a space for Gadfly to call their own in. I didn't. What I wanted was to find out if we were capable of running an arts space. I wanted to know what that would look like artistically and fiscally. I wanted an experiment. I figured that out pretty quickly upon moving in after a couple of fiascos with keys and doors being unlocked. Now? I am 1,000% positive that I want a space for Gadfly to call their own--but it took realizing it was time to step away from THIS space at THIS moment in time to realize that A) this experiment was successful, but it's over, and B) I was absolutely right about us needing a space to run. There are lots of reasons to do big, audacious things with your life. Do not convince yourself that each bold step is THE step or is meant to last forever. Sometimes an experiment is just an experiment. Your job is to know when it's done. Know when something is and is not for you. I can not stress this enough. While it seems like Manny and I act fast sometimes, we never do anything without at least three in depth conversations and a night or two of sleep between each one. We think through every detail, every pro and con, every possible outcome to our so-called hasty decisions. The biggest thing we weigh is "what about this are we meant to work with, and what are we meant to let go of?" A lot of letting go of the gallery came down to this example (which was one of many factors in the decision): we are a wildly inclusive company, but the bathroom in this building was down a flight of stairs. There were days my arthritis was so bad I would buy a $6 coffee next door so that I could use their bathroom and avoid stairs. If the artistic director of a company can not use it's restroom, that is not acceptible, accessibility-wise. This means people in wheelchairs, with mobility issues, or have to use a restroom urgently and suddenly could not comfortably come to our shows. This was a huge problem, and my guilt over the situation increased as our popularity in the space grew. So running a space is definitely for us. Running a space without easy restroom access is not. This lesson can and has been applied over other areas of my life even since shutting down the space. Certain kind of client questions are not for me, and I can refer them to someone else when they come up. That doesn't mean I'm not a superb reader, it just means I know I'm not best suited to some questions. As much as we hate to admit it, a lot of our happiness does come down to the choices we are making. I am in no way shutting down how hard mental and physical illness, societal oppression, or actually toxic situations make our life. Please note I said A LOT of our happiness comes from our decisions, not all of it. My advice for ANY choice is to get super clear on what works for you and what doesn't first. I would also add to the above note, especially since I did mention external pressures and pain: know when you're making a choice. Full disclosure? We did have some expected funding fall through, and that was a factor in making the decision to close the gallery. It was not, however, THE decision making factor. Shutting down the space was 100% our choice. We had enough resources and renters to keep going, and it was an incredibly hard decision to reach. One message that keeps coming to me spiritually is one to own my choices, and acknowledge when I am able to make one. In all of my careers it is sometimes easy to feel like things have been thrust upon me, but that isn't the reality nearly as often as I would like it to be. Usually I am given a choice. Figure out what the choice or decision is, and be aware you are making it. Be grateful. Be grateful. Be grateful. This gallery, started by a dear, dear friend of mine was incredibly special. I met my current group of friends that I see the most and consider the closest there, long before it was mine. I fell desperately in love, and then harshly, quickly, angrily out of love in this space. It has been an unendingly vocal space about shaping my art and my life. I created really magical artwork there, and so did so many other fabulous people. I am sentimental to a fault and I had a three day sadness spiral about the space dissipating. But now I'm just so ecstaticly happy that I got to be a part of it and a curator for it, even for the small space in time that it was. There is a not an area of my life where I can slack off on gratitude right now--and that alone, is more than enough reason for the gratitude itself. Look ahead. There is so much New Age philosophy about staying present, and it's not wrong. Until you can look around and enjoy where you are, you probably aren't going to move forward in leaps and bounds. However, the way you close an experiment is by looking into your actual future. Gadfly is building a proper, working board of directors and otherwise taking it easy for the year outside of producing events. In approximately one year we'll start looking for a semi-permanent space. If those plans weren't in place before we made this decision, who knows how long we would have waffled or if we would even have made the right decision. There is no use staring into the future and hoping for better without enjoying the work you're doing to get there. There's also no use in pretending the future doesn't exist. That's it for me and the Multi-Passion Diary today y'all! Sending so much love and light until next time. Hello all! Welcome back to my ongoing Multi-Passion Diaries where I explore what it's like to be a theatre making, tarot card-slinging, freelance writing entrepreneur and general adventurous but introverted human in today's world. I also host guest blogs, which is what today is! E-mail snow.cassandra@gmail.com if you're interested in contributing. I'm so, so excited about our guest blogger today. Abbie from Northern Lights Witch is a close friend of mine (she even crashed in my spare bedroom for awhile when her job life got weird) who runs a really great witch business while managing a career in Public Policy. Read all about how she juggles the two and what she's learning along the way. I have always, always been a multipassionate. When I was a child, I wanted to be both a journalist, and an artist, and also I wanted to be a biologist. All at the same time. In high school, I spent my early mornings with the jazz band, worked hard to keep my grades up and my writing top-notch, and spent the evenings in rehearsal as an actress. I almost went to school to become a jazz musician, but decided during my senior year that I would rather be a writer. By the end of my senior year, I had decided that the best way I could make a difference in the world was to become a human rights lawyer. Spoiler alert: I am none of those things now. I don’t play in a band, I don’t work for a newspaper, and I don’t have a law degree. What I DO have is a Master’s in Public Policy, with a part-time job working on water policy and mining in Northern Minnesota, and a tarot business. I miss the arts. I miss playing music – when I listen to music, I yearn to play, and when I try to play I’m frustrated that it’s not as easy as it once was. I miss performing. But I am able to write in all of my careers. Writing is the constant that holds together all the pieces of me. Recently, I wrote on my own blog (link to my multipassionate post) about the cycles that you go through as a multipassionate professional. It’s important to recognize that sometimes, when you’re balancing two (or more!) careers, you need to put more energy into one of them than the other. That doesn’t mean that you don’t still have those multiple careers – it just means that the balance has shifted somewhere different for a while. For the last ten years, I have put almost all of my energy into my career in public policy. To an extent, it’s important to be creative in the field of public policy. It takes a deep level of analysis to take in all the information that you need, and to find new solutions to difficult social and environmental problems. But there isn’t that sense of freedom I crave. I started Northern Lights Witch while I was still seeking my Master’s degree, in large part because tarot was (is?) having a Moment and it’s been a part of my personal spiritual practice for over 12 years. But really: I needed an outlet where it was ok to talk about my understanding of the world in terms of intuition, rather than logic. I needed a space where I could deeply explore my identity as a witch, as well as write creatively about witchcraft and the Unseen parts of the world. It was a rebellion against the strict career positioning necessary in a graduate program. But as I’ve moved through both careers, I find that they really do inform one another in interesting ways. They are very different, and use different parts of my brain, but there are lessons to be learned that carry through both places. Trust your goddamn intuition. As much as public policy is about logic, it is also about intuition. This is especially critical when communicating with decision makers and those who hold power. It’s more important to read between the lines, to read the body language rather than the words. Now, I am not a mind-reader and it’s important to give people the benefit of the doubt, but it is possible to pick up a lot from nonverbal communication. Those gut instincts? Critical. Do. The. Work. When you’re working on legislative campaigns and issues, things move quickly. Sometimes, you’ll be asked to produce a policy memo in two days that needs to be researched in depth. I once wrote a policy brief that was 10 pages with 160+ individual citations in a week. I need to do a better job of translating this work ethic to my own tarot business, but I know that I have a capacity to produce top-notch work on a short timeline and with few resources. Know when something is outside of your control. Reading tarot has made me keenly aware of forces that are greater than myself. The election of Donald Trump to the presidency, and the subsequent radical alt-right takeover at many other levels of governance, has taught me important lessons about playing defense. And a lot of the time, things are outside of my control – and so I need to know when to use my power and how to use my power to the greatest advantage. Witchcraft and tarot are both ways of exploring the unknown, ways of exploring your own power. It is far easier to influence policy for the better when you know what is and isn’t within your sphere of influence. It’s important to concentrate your energy where you will actually have power, instead of needlessly running into walls. Tarot helps me accept that which is not within my control, and can remind me when I’m not focusing well. Tarot and public policy hone crossover skills – writing, intuition, communication, analysis – but they also hold particular tensions. When I accepted my current job, I decided to have my birth chart read for the first time. I knew that I would be moving to a more rural community, and I had concerns about being “out” as a witch. She advised me that it’s important to first establish credibility as a kickass environmentalist, and then to mention that I’m “tarot-interested.” I still haven’t told my boss that I do tarot readings. I’m terrified that I will lose his respect – or fail to gain it. And so I need to be careful about how open I am. My last name isn’t listed anywhere on my website, nor is my address. This has made it hard for me to fully throw my energy behind marketing, getting myself out there, and pitching podcasts and blogs. Not all positions within the field of public policy come with these politics – but navigating the field as a young person means I need to think critically about this. I need to establish credibility above anything right now. Soon, I hope to have a position that will allow me to bring my full self to all aspects of my work. Until then, I must keep my witchcraft in shadow. But the lessons I learn from the tarot resonate through all aspects of my life, and make me a stronger advocate. No matter how open I am about them. More About Abbie here, including bio and tarot info.